So the first episode of Mistresses – starring Alyssa Milano, Rochelle Aytes, Jes Macallan and Yunjin Kim – has been aired last week. Like the title already gives away, the story evolves around 4 friends who are mistresses or whose husbands might have one. It comes off very stlyish but reminds me more of a soap opera than a drama. In my oppinion only Alyssa Milano and Yunjin Kim are able to deliver a pleasing performance, while the other two are so and so. The story is a little predictable but non the less entertaining. Hopefully we can expect a few twists and the actresses who seem a little bla in the pilot are just warming up. Hit-Prognosis: 60% – It might be a hit, but I heard Alyssa is only in the show for 6 episodes, and I wonder if the show can live without her. UPDATE: Alyssa Milano is in all 13 episodes. One of my sources (IMBD) messed that one up. ****UPDATE 18 JULY*** Mistresses‘s status changed from questionable to must-see. After last episode’s twist I can’t wait to see how it continues. Another thing I like about the show is they don’t talk around the bush for too long, and actually confront their problems. Pingback: Mistresses Episode 9 Recap – The love of a flaky mother, the lost husband who refuses to leave, and false accusation | Simon Says... WATCH THIS! 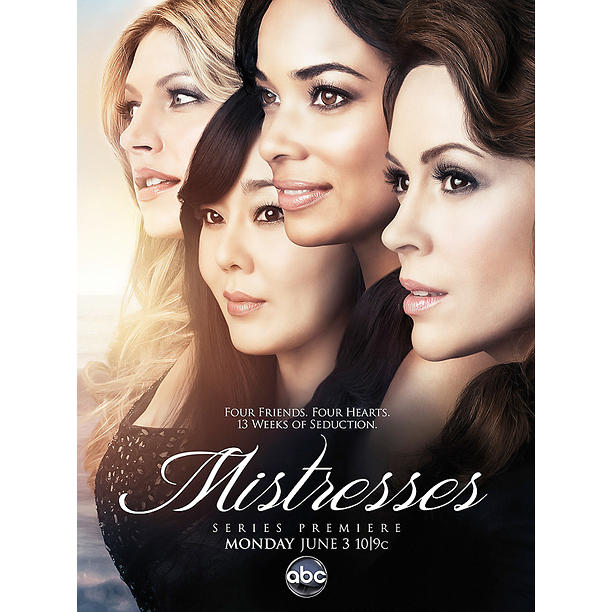 Pingback: Mistresses – Are you a fan yet? | Simon Says... WATCH THIS!